Welcome back to the Mass Effect™: Andromeda gameplay series. In our first two videos, we took a closer look at weapons and skills, and then profiles and squads. In this installment, we’re diving straight into the heart of Mass Effect: Andromeda – exploration. The Andromeda Galaxy is filled with worlds to discover and diverse locations to explore. 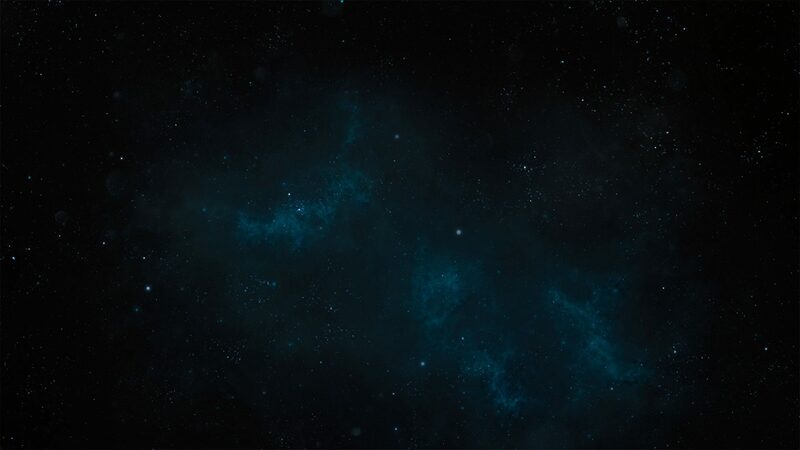 The story in Mass Effect: Andromeda takes place in the Heleus Cluster, a portion of space populated with dozens of star systems. You can navigate these systems using the Tempest’s onboard Galaxy Map and see everything that exists outside your ship’s many windows in real-time. Planets, moons, space anomalies, and starships will all be visible from the Tempest. As you look over the map, you’ll see dozens of systems and over a hundred planets in the Andromeda Galaxy, including several that you can explore on foot. That’s where your adventure will begin in earnest. Each world visited will have its own story, characters, and—of course—challenges. In our gameplay video above, the world we’re visiting is Elaaden. When you explore the opening landing area, called Paradise, you’ll quickly discover that the heat on Elaaden can be deadly, that water is scarce, and that mysterious ancient artifacts are scattered across the landscape, guarded by dangerous remnant creatures. To make a life on Elaaden, you have to be desperate – or krogan. Yet even the krogan aren’t happy, and they don’t trust anyone from the Andromeda Initiative – least of all a Pathfinder. 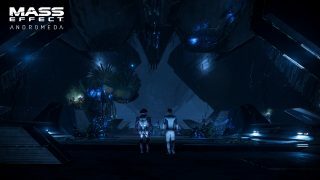 How you deal with the krogan and the challenges that go along with them will ultimately determine success on Elaaden. The Nomad, your all-terrain rover, is key for quickly covering the expansive landscapes throughout the Andromeda Galaxy. You’ll be able to enhance the Nomad with a series of functional upgrades designed to give you better Turbo Boost, higher jumps, better handling, and more. While exploring, one of your objectives will be to discover locations where you can call down Forward Stations. Once found, each of these Forward Stations acts as a fast travel point, allowing you to change your loadout or call the Nomad if it gets lost or destroyed. It also allows you to resupply, while protecting your team from any environmental hazards. In some locations, like the dunes on Elaaden, you’ll be exposed to localized and/or global hazards, such as extreme temperatures. The Pathfinder and the Nomad are both separately outfitted with Life Support systems that help protect against these hazards, but once these systems run out of energy, you’ll need to find a safe location or a Forward Station to recharge them. When traveling throughout a planet, you’ll discover new areas to explore, characters, and storylines. Ultimately, all your discoveries will help raise the Viability of the planet, which in turn lets you to create an outpost and upgrade the Nexus – the Andromeda Initiative’s space station. Before a planet can support an outpost, you’ll need to raise its Viability to at least 40% by countering threats, allying yourself with the locals, solving environmental problems, and accomplishing specific tasks related to that planet’s story. 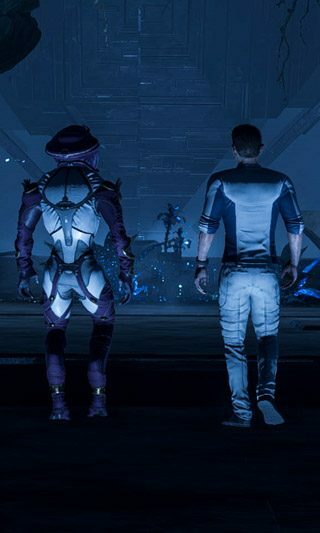 In the case of Elaaden, for example, your relationship with the krogan ultimately determines whether the viability of an outpost. 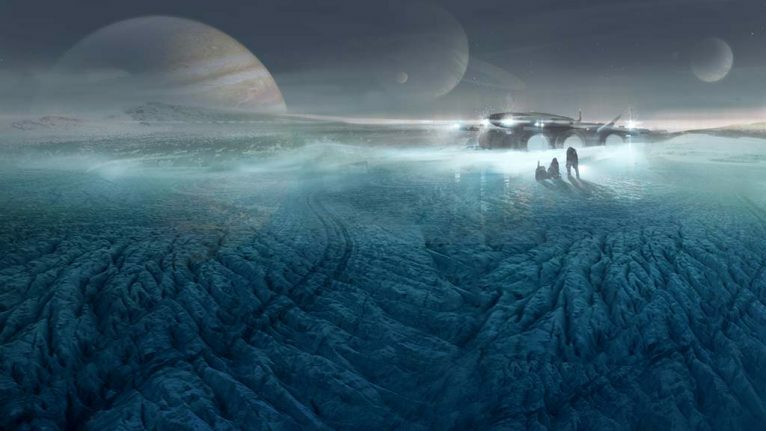 Additionally, your exploration and discoveries nets you Andromeda Viability Points (AVP). Attaining certain AVP thresholds makes upgrading the Nexus possible and wakes up more colonists from cryo-sleep. Which colonists you decide to wake up determines what perks and advantages you’ll be able to utilize. Want to get an edge in research and development? Wake up scientists. Need more combat prowess? Rouse the military personnel. Want some help with trading? Call in the merchants. The choice is yours! No one said finding a new home for humanity would be easy. The Andromeda Galaxy holds many mysteries, not the least of which is a vast network of ancient Vaults. Simply figuring out how to access one of these Vaults is a challenge, taking you across an entire world to complete. 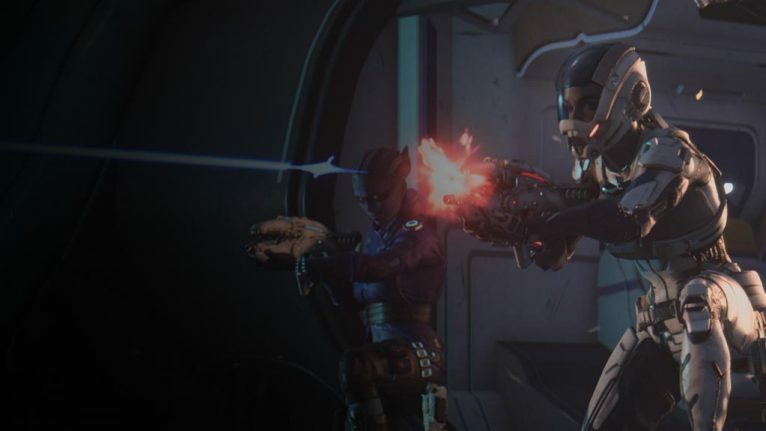 Once inside a Vault, you’ll need to rely on every element of Mass Effect: Andromeda gameplay – including exploration, environmental navigation, puzzle-solving, and combat – to bring them online and make it out alive. Resolving the mystery of these Vaults may hold the key to survival in the Andromeda Galaxy. If you like building and modifying weapons and gear to match your unique play style, you’ll love our deep crafting system. In Mass Effect: Andromeda, assembling your ideal equipment relies on two key components: Research and Development. Research: When exploring, you’ll want to scan all the unique wildlife and tech you discover to earn Research Data related to your subject. The more you learn, the more unique and rare blueprints and augmentations you’ll be able to unlock. Development: Once research is done, it’s time to craft. Look at the blueprints to see what materials are needed and where they can be found. Get materials from merchants, find them while exploring on foot, mine them with the Nomad’s drone, or discover them while exploring space in the Tempest. Depending on the materials used and the research you’ve done, you can apply augmentations while building gear. Aerial Stabilizer: If used while crafting a weapon, grants accuracy to weapon damage whenever you’re hovering. If used while crafting armor, improves your biotic powers while hovering. Beam Emitter: Replaces the firing mechanism of a gun with an energy beam. Turn your Avenger into a laser rifle! Coolant Unit: Increases clip size whenever special ammo is in use, allowing you to get the most out of your cryo, incendiary, or disruptor rounds. Shield Disruptor: If used while crafting a weapon, increases the power of your disruptor ammo. If used while crafting leg armor, adds an electrical discharge to your air melee attacks. Vintage Heat Sink: Converts any gun to an overheat system (like in the original Mass Effect™), where you’ll never run out of ammo. Additionally, a huge variety of mods can further enhance your weapons abilities, as well as Remnant “fusion mods” that can upgrade your armor. And the more you explore, the more materials you’ll find, the more amazing things you’ll build, and the more devastating you’ll be on the battlefield. At its heart, Mass Effect: Andromeda is a game of discovery and exploration. The choices made and the places visited let you blaze a unique trail through the Andromeda Galaxy. Whether exploring the depths of a crashed starship, or delving into the core of an active volcano – the more you engage with the world around you and the characters in it, the more that world will surprise with what’s waiting just around the corner. 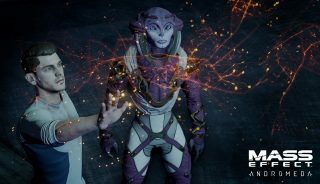 Mass Effect: Andromeda launches on March 21 in North America and March 23 in Europe. Sign up for the Andromeda Initiative now to receive pre-departure training information and exclusive in-game rewards.